Alaska Cruisetours require extra planning to find the right one that fits your interests, budget and time available. There are many things you may want to avoid to ensure you have a great Alaska vacation experience and aren't disappointed. The cruise lines have adopted many "cookie cutter" tours that are a very superficial look at what you went to Alaska to see. We can help you find one you understand up front and know exactly what you are going to get. We can also offer alternatives that may represent a much better value for your vacation dollars. An ounce of planning prevents a pound of disappointment. Because of the extremely large number of Alaska cruisetour combinations, please fill out the price quote request or call us at 877 836-1949. There are a number of things to consider in cruisetours and it is important to find the one that is right for you. See all of Alaska. From the southeast by sea on a cruise ship to the interior Heart of Alaska by scenic railcar, motorcoach, plane or combination of all of the above, you will have the adventure of a lifetime. The rugged beauty and fascinating wildlife will excite you and make you glad you chose the complete Alaska package. The majesty of McKinley is not to be missed. 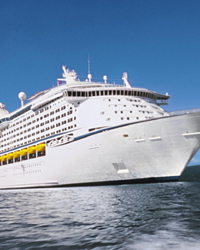 Cruisetours can either begin in Vancouver BC and end in Anchorage or Fairbanks or vice versa. Often times, southbound cruises have more favorable pricing simply because most people prefer northbound. Either way you do it, you won't be disappointed. Cruise tours offer the best of both worlds, combining a seven-day cruise with a three-to-seven-night land tour. All you have to do is decide where in Alaska that you'd like to go. With so many cruise tours to choose from, there's bound to be one that's just right for you! Step 1 – Determine How Long A Vacation. 5 nights - Explore Alaska's Heartland at a more comfortable pace. Step 2 – Decide Where You Want to Go. 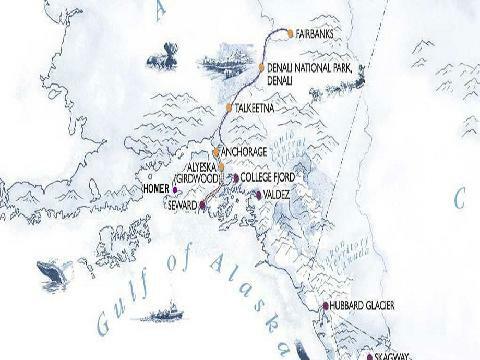 See the most popular spots such as Anchorage, Denali National Park and Fairbanks, or take off and explore areas like Copper River, Kenai Peninsula, Prudhoe Bay, or the Yukon. Step 3 – Choose your Tour before or after Your Cruise. To start with your cruise, choose a Northbound sailing. To explore Alaska first and finish with a cruise, choose a Southbound sailing. Step 4 – Decide When You Want to Travel. The Alaska season is May to September, with the best prices for early and late summer dates. Step 5 – Choose Your Stateroom. The least expensive are inside staterooms or upgrade to an ocean view stateroom, Balcony stateroom, or mini-suite. Step 6 - Take A look at the cruise search box above. It is already set to show you a wide variety of cruisetours available with pricing and special amenities. If you have a preference for a certain cruise line just select it and you will see all the current offers. Start your journey in Vancouver on a northbound cruise the last week of July or the first week in August when you have the greatest probability of the best weather. If your budget allows it, I highly recommend you take a balcony cabin on the aft (back) of the ship. This gives you a full view of both sides from the ship and a very comfortable windbreak to sit and take in the beautiful sights in the comfort of your own balcony without fighting the crowds. The balconies are a little bigger on the back of the ship and quite comfortable. If a balcony on the back won't work for you, go with a balcony or oceanview stateroom on the starboard (right) side of the ship for maximum viewing of the land side for northbound cruises and the port side for southbound cruises. Once in Seward, opt to take the train across the Kenai Penisula to Anchorage if possible. It is more scenic and comfortable and opportunity for wildlife viewings may be a little greater. If you are arriving in Whittier, you won't have quite as scenic of a transfer to Anchorage but it will still be nice. Once in Anchorage, spend a bit of time at the Native Heritage Cultural Center and downtown Anchorage on 4th Street for the best shopping. A great meal at Simon & Seafort's will give you a taste of Alaskan King Crab at its best. From Anchorage, a scenic railcar trip to Talkeetna to view the majesty of Mt McKinley (Denali - The Great One) is a must. Talkeetna is a great little town with a lot of character. For the most spectacular event of your life take the flightseeing trip to the top of McKinley from K2 Aviation in Talkeetna. The scenery is breathtaking and it gives you a real appreaciation for the enormity of the glaciers and the mountain. From Talkeetna, reboard the train for a journey to Denali National Park. A white water rafting trip will give you thrills and a view of the outback. A night at the Denali Dinner Theater is a fun way to enjoy the history and culture of Denali. We recommend you spend at least two nights there so you can do the Deep Tundra Wildlife Tour that goes 53 miles into the park instead of the Natural History Tour that only goes 15 miles in and is only 3 hours long. The deep tundra tour is where you will see the most wildlife and see the beauty of this great park. From Denali, reboard the train and head to Fairbanks. Along the way, opt for the Prime Rib Dinner aboard the train. You will not be disappointed. After spending the night in Fairbanks, be sure to do the Riverboat Discovery on the Chena River with a visit to the Chena Village. It is a totally non commerical village where you see firsthand the native culture, traditions, crafts and customs. It is fascinating. If time permits, a visit to El Dorado Gold Mine is fun. After you complete the journey described above, you will come home having really experienced Alaska and all its spectacular beauty. You will have a lifetime of great memories and probably start thinking about when you can go back. It is truly the Great Land. If you've been to Alaska before and are looking for something a little different, Wilderness tours to Kenai or Copper River are outstanding. Even though remote, they have outstanding new lodges that provide great views and a lot of interesting activities. Copper River is a great place to see the TransAlaska Pipeline upclose. A jetboat tour on the river can give you incredible views of wildlife and the remote lifestyle Alaskan's cherish. A short flight to Kennicot and McCarthy can provide day of adventure ambling through the great copper mine and town and McCarthy shows you life in remote Alaska as it was and is. It is a real adventure. Whatever you choose to do, an Alaska Cruisetour is an experience like no other. Vancouver BC - Scenic and sprawling, Vancouver is fronted by the Pacific, backed by the alluring Coast Range and dotted with green parks. The city's busy waterfront is within walking distance of its business center. Nearby you'll find leafy Stanley Park, exotic Chinatown and many fine museums. Inside Passage Cruising - Enjoy such stunning sights as green islands, sparkling glaciers, and a coastline that features the most majestic of mountains as you cruise the Inside Passage. Juneau - Accessible only by sea or air, Alaska's modern capital city maintains the trappings of its 1880's gold-rush era. Discover the Capital building, historical distric and the infamous Red Dog Saloon. Nearby, explore the Mendenhall Glacier, a massive river of blue ice. Ketchikan - Built on an island along the watery Inside Passage of the southern end of Alaska, Ketchikan exudes a frontier spirit. It is known for its many totem poles, dramatically carved by Indian artists. Visit the quaint houses and shops on historic Creek Street, built on stilts along a stream. Skagway - When gold was discovered in the Klondike, the settlement of Skagway grew overnight from one cabin into a city of 20,000. The prospectors finally left, but the false-front buildings and boardwalks remain. Taste the history at the Red Onion Saloon or at the Klondike Gold Rush National Historical Park. Sitka - Bounded by towering mountain peaks and the Alaska Marine Highway, Sitka boasts two pasts, as a Tlingit Indian village and as the capital of Russian America. Capture the spirit of both legacies at Sitka National Historic Park or at the elaborate Russian Orthodox St Michael's Cathedral. Icy Strait - Greys, Minks, Humpbacks and Orcas are just some of the impressive whales you may encounter along the Icy Straits in Alaska. With a forest-like atmosphere, the Straits offer a main feeding area for many marine mammals. Hiking or kayaking will be the perfect way to view these amazing mammals in their natural habitat. Haines - This historic town occupies a breaktaking setting on a peninsula along the deep blue waters of the Lynn Canal. Its Tlingit Indian heritage is preserve through art and dance at the Chilkat Center for the Arts. Visit the Chilkat Bald Eagle Preserve to see Alaska's most magmificent birds. Hubbard Glacier cruising - Hubbard Glacier, longest tidewater glacier in North America, begins its 76 mile journey to the sea on the slopes of Mount Logan, the tallest moutain in Canada and part of the largest non-polar icefield in the world. At the point where it enters Disenchantment Bay, at the head of Yakutat Bay, it is 6 miles wide. Hubbard Glacier has been known to advance so fast that it dammed Russell Fjord and created a lake behind it, trapping many marine species. A dozen years after this phenomenon, the dam no longer exists, and Hubbard is no longer the galloping glacier it once was. But the continent's greatest tidewater river of ice stilll flows at a fast trot, regularly disgorging enormous calves into the waiting arms of the sea. Glacier Bay cruising - With it's snow capped mountains rising to over 15,000 feet, Glacier Bay is one of America's most spectacular National Parks. Made up of a grand collection of jagged glaciers comprising an entire array of ecosystems, lush forests and protected coves open way to beautiful saltwater beaches and jewel-like lakes. Glacier Bay National Park and Preserve, a 65-mile-long fjord, is a marine wilderness park, a living laboratory for observing the ebb and flow of glaciers, and a chance to study life as it returns in the wake of retreating ice. Tracy Arm cruising - Tracy Arm is a narrow 26-mile winding fjord that was once a glacier filled valley and is lined with sheer ice carved walls rising thousands of feet on each side. This spectacular fjord gives you a look at terrain most recently exposed by the retreating glaciers of the last ice age. Countless numbers of waterfalls appear at each turn. Icebergs make their way out to sea in all sorts of wonderful shapes. Mountain goats cling to the sheer cliffs of the fjord. The fjord ends spectacularly with the twin Sawyer Glaciers. Prince William Sound - contains some 3,000 miles of shoreline backdropped by enormous glaciers, dense forests, and the snow-topped Chugach Mountains. Within Prince William Sound are a multitude of islands of varying sizes, largest being 50-mile-long Montague Island. These islands act as natural breakwaters from storms in the Gulf of Alaska. Protected waters and the many small inlets provide excellent opportunities for exploration in sea kayaks and small boats.Prince William Sound gained notoriety during the devastating 1989 spill of oil from the Exxon Valdez. The impacts from that spill are still being felt in parts of the region, but visitors are not likely to see any direct evidence of the damage. This is still a very beautiful place. College Fjord - At College Fjord, an inlet rimmed by icy crags, you sail past glacier after ghostly glacier. The first serious explorers here were financed by a group of Ivy League colleges, hence the name. Seward - The original starting point of the Alaska Railroad, Seward retains the unspoiled air of a rustic fishing port. Not far from town is Harding Ice Field, an area three fourths the size of Rhode Island. Named for President Lincoln's U.S. Secretary of State William Seward, who negotiated the purchase of Alaska from Russia in 1867, this tiny fishing village is encircled by the Alaska Maritime National Wildlife Refuge, the Kenai National Wildlife Refuge, the Chugach National Forest and Kenai Fjords National Park. Otters, seabirds, black bears and moose are just a few of the area's inhabitants. Whittier - At the head of the Passage Canal, originally was part of the portage route for the Chugach Indians of Prince William Sound traveling to fish the Turnagain Arm:later the Russians and Americans exploring the region also used this portage. It was used extensively by prospecting miners during the gold rush as it was the quickest passage from the Sound to the Cook Inlet and Interior regions.The city itself is a historical landmark, established by the U.S. Army during World War II. The Whittier railroad to Portage was completed in 1943 and became the primary debarkation point for cargo, troops, and dependents of the Alaska Command. In 1948 the military began construction of the first of two buildings for their military personnel as the Port of Whittier was then recognized as an ice-free, deep water port strategically located to Anchorage and Interior Alaska. The city of Whittier, incorporated in 1969, purchased the town site from the federal government in 1973. Today, less than 300 people reside in the town supporting the Alaska State Ferry, the Alaska Railroad, the Alaska Hydra Train, the military tank farm for aviation fuel, the Small Boat Harbor and tourism in general. You can see Birds, Sea Otter, Seal, Whale, Sea Lion, Porpoise, Glaciers, Waterfalls, (watch Horse Tail Falls flow up!) Goat, Deer, Bear and more in Whittier! Anchorage - Surrounded by all the beauty and activities of Alaska, Anchorage offers a unique blend of spectacular scenery, Russian and Native heritage, Alaskan adventure and big city amenities. Alaska's largest city lies between the Knik and Turnagain arms of Cook Inlet and the rugged Chugach Mountains. It is home to more than 240,000 residents, 40 percent of the state's population, and serves as the financial, communications and transportation hub of Alaska. The municipal boundaries stretch for more than 50 miles from Portage Glacier to the head of Cook Inlet and encompass 1,955 square miles. Denali - It's more than a mountain. Denali National Park & Preserve features North America's highest mountain, 20,320-foot tall Mount McKinley. The Alaska Range also includes countless other spectacular mountains and many large glaciers. Denali's more than 6 million acres also encompass a complete sub-arctic eco-system with large mammals such as grizzly bears, wolves, Dall sheep, and moose. The park was established as Mt. McKinley National Park on Feb. 26, 1917. The original park was designated a wilderness area and incorporated into Denali National Park and Preserve in 1980. The Park was designated an international biosphere reserve in 1976. Today the park accommodates a wide variety of visitor use including wildlife viewing, mountaineering, and backpacking. It continues to provide a laboratory for research in the natural sciences. Fairbanks - Before the construction of the Alaska Highway, the establishment of military bases and Alaska joining the Union as the 49th state, Fairbanks was a bustling mining town in the middle of the largest territories in the United States. Felix Pedro, an Italian immigrant, is credited with the initial discovery of gold in 1902. As luck would have it, Captain E.T. Barnette's goal of building a trading post on the banks of the Chena River coincided with key gold strikes north of town. Subsequently, Fairbanks was incorporated by a 75% majority vote in 1903. One hundred years later, the small boomtown has a diversified economy, with oil, gas, gold and coal mining, military, tourism and the University of Alaska as key components. Fairbanks continues in its role as the services hub and gateway to Alaska's Interior and Arctic. With a population of close to 32,000, Fairbanks' citizenry swells to 82,000 when including the surrounding Fairbanks North Star Borough. With key discoveries in the surrounding hills and creeks following Felix Pedro’s gold strike in 1902, prospectors spread out to pan and sluice, followed by small manual drift mines and draglines to the monster floating dredges and lode mines. Historic visitor attractions and modern day mining operations celebrate the quest for gold as Fairbanks enters its second century. Try your hand at gold panning and uncover your own Alaskan gold. See the largest public display of gold in the state at the UA Museum. Visit the Pedro Monument in tribute to gold’s first discovery. Find that perfect gold nugget souvenir to take back home. Discover why Fairbanks is the “Golden Heart” city. Play like an Alaskan amongst the 7 Natural Wonders of the Kenai Peninsula! The Kenai Peninsula Borough is 90% Wilderness and located just south of Anchorage. the panoramic playground is just the place to ‘Spot the locals’~ wildlife in their natural habitat, Sense the Kenai Peninsula Hands On~ sightseeing, get in the Fish Zone. The 7 Natural Wonders provide you the opportunity to ‘Capture the Wonder’ of the Kenai Peninsula with every photo you shoot. Copper River - The Copper Valley is well centered for adventure, whether it be on a river, glacier or a mountain. The Copper Valley, which includes the Wrangell-St. Elias National Park and Preserve, is located in Southcentral Alaska. 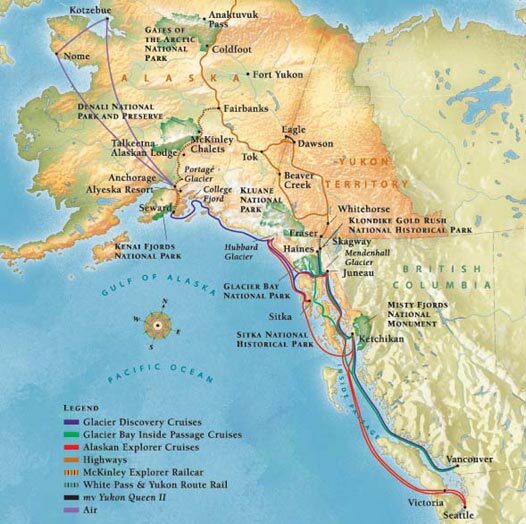 Located 189 miles northwest of Anchorage, 250 miles south of Fairbanks and 115 miles north of Valdez, and approx. 200 miles from Canada. The Copper River Valley is accessed by two major highways, the Richardson (Rt.4) and the Glenn (Rt.1). Surrounded by four mountain ranges, the Wrangell-St. Elias mountains to the east, the Alaska Range to the north, the Chugach to the south, and the Talkeetnas to the west. The Wrangell Mountain Range has some of the highest peaks in North America: Mount Sanford 16,237 ft., Mount Drum 12,010 ft., Mount Blackburn 16,390 ft., Mount Wrangell 14,163 ft. Because of this great location, vast wilderness, spectacular scenery and wildlife, many visit Copper River Valley, Alaska for the adventure of a life time. Summer recreational activities include rafting, hiking, flightseeing and excellent fishing; King Salmon, Copper River Red Salmon, Trout, and more in the Gulkana River, Klutina River, Copper River and vast lakes.